These socks were meant to be big foot socks for my big foot son, but my gauge was off - achieved 7 stitches per inch instead of 6 - so now these are going to my SO. I blame my gauge problems on the switch to lever knitting (a.k.a. Irish cottage knitting). I even upped the needle size from my usual US2 to US3 for this DK yarn. AND I knit a swatch! Sometime it just doesn't matter what you do. I'm a little bit excited about a detail I invented to avoid the dreaded gusset gap. Noticing that the circumference of one's calf just below the calf muscle is about an inch larger than the girth of the ball of one's foot, I cast on extra stitches for the sock top - 60 in this case. Then I worked the heel flap over 28 stitches. While picking up stitches for the gusset, I slipped 2 stitches from each end of the instep needle to each of the gusset needles. Those extra stitches get worked into the gusset and the gussets are decreased to 28 stitches on each side. The foot is then 56 stitches around. This produces a great fitting sock AND no futzing around to fix the gusset gap. Huzzah! Has anyone read of a similar solution? I can't recall seeing this idea anywhere else, so I am hereby declaring it to be my very own creation. Patent pending. One fun aspect of frequenting local fiber arts festivals is, many of the vendors are becoming old friends. One bad thing about that is, I feel obligated to make purchases at their booths. Fortunately, they were selling what I was looking for. Solid colored sock yarn, in this case naturally dyed, walnut on the left, sandalwood on the right, from Little Shop of Spinning. Roving "rose" in pre-selected colors, from the Big Red Barn. But there were other vendors (whose names I did not get) to buy from as well. This BFL roving came from the same booth as the above mentioned merino. Packages of sparkly samples (for blending) were available from several vendors. I also took the intermediate spinning class. At the last minute, there was an instructor switch, but it worked out okay. We each got help with our individual spinning challenges, plus we learned to do the "supported long draw" method of spinning to augment the "inch worm" method we all learned originally. Two hours in a metal folding chair was all my back could take, so I packed up a little early and headed home. In the pre-DST dark. On highways with buggy lanes. Fortunately, the few Amish buggies I encountered had flashing tail lights. After reading the latest from Clara Parkes, I wasn't sure I wanted to read another book of knitting stories, but Knitting Yarns (edited by Ann Hood) is a refreshing change of pace. 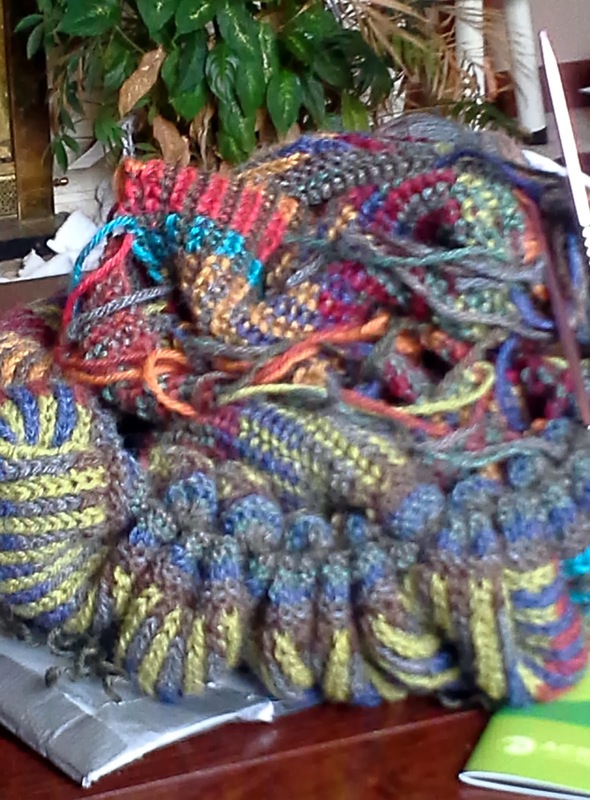 All of the contributors are writers but most are not knitting writers, and some are not even knitters. There were a few knitting-as-metaphor bits, but mostly the collection focuses on how, one way or another, knitting impacted their lives. Many of the names are familiar: Barbara Kingsolver, Hope Edelman, Elizabeth Berg, Sue Grafton, Jane Smiley, etc. This book became my bedside reader, the one I reached for when I wanted a little finite something to read before sleep. And there were patterns! Which brings me to my only complaint about this book: no pictures, not even line drawings, to go with the patterns. To see them, you have to go to the designer's website. Otherwise, this book is a pleasant diversion. My SO doesn't usually ask for a specific handknit, but he saw this Fibonacci sweater-vest in Knit One Below and fell in love. 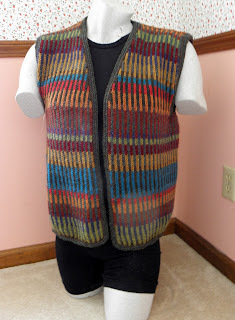 The pattern called for detachable sleeves, but I knit it as a vest so as not to bring the curse of the boy friend sweater down upon our heads. He picked out the 13 colors and the order of the colors. I created a spreadsheet to keep track of the colors and sequencing. 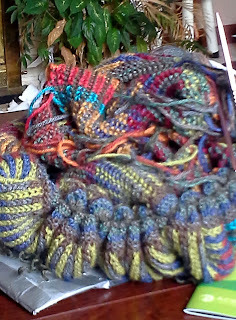 Knitting one below is not difficult, just tedious, as each row is basically knit twice. The result is a double knit fabric that is quite toasty despite its light weight. 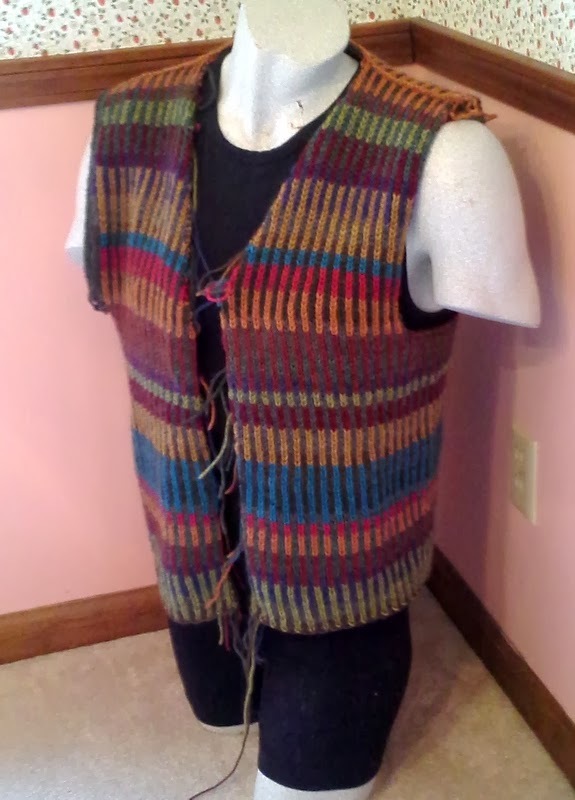 This vest was knit all of a piece - no seams except the special 3-needle bind off at the shoulders. The toughest part was knitting the edging, as I could have used a much longer circular needle. Either I did not understand the instructions for picking up stitches or the instructions were just plain wrong, as I knit the edging at least twice, if not three times before it was wearable. The only other major snafu I encountered was due to my inability to count: one front side was a row or two longer than the other, which I didn't discover until after seaming the shoulders. I'm glad I made the effort to correct it. I started this project March, 2013, and just yesterday stitched up the armpits and wove in the last of the ends. What took me so long? Just me. My knitting MO is to knit and knit and knit some more, until I hit a snag (in this case, first the edging, then the armpits) and then the poor thing sits abandoned until I put on my big girl pants and finish it. Yarn: Knit Picks Wool of the Andes, in 13 tweedy colors; I ordered the full amount suggested in the pattern and have almost half of it leftover. Modifications: The sample in the book was knit in DK weight yarn, but we went with worsted; for the edging, I picked up one stitch for each row, one for each column; when binding off, I bound off in purl, but around the bottom did a YO bind off, still in purl, so as not to constrict the fabric. Ordinarily, I don't consider a project done until it is blocked, but this one has sat on Mr. Manly so long that I am turning it over to my SO while winter still holds us in its icy grip. It also needs buttons, which will require some searching. In the meantime, I am considering this project FINISHED.